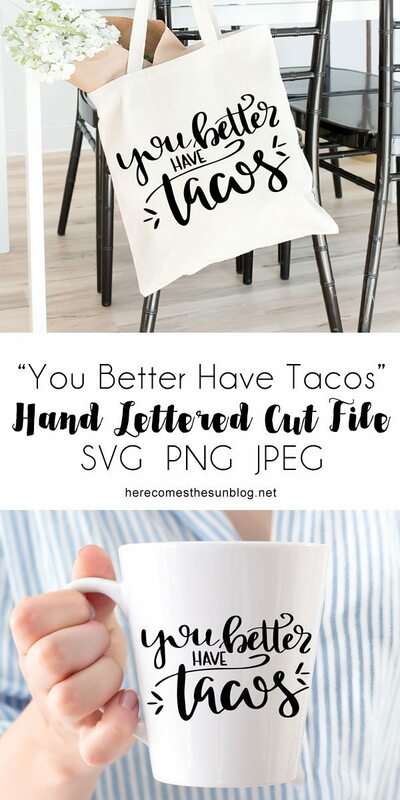 Use this cute hand lettered tacos cut file to display your love of tacos! Free cut file download for Silhouette or Cricut! Sometimes you just need tacos. And you need everyone to know. In our house, we have Taco Tuesdays. My kids get really upset if we have anything other than tacos on Tuesdays and as I sit here and type this, I am realizing that it is Tuesday so my question of “what will I cook for dinner tonight?” has been answered. Tacos it is. If you love tacos as much as my family does, why show your love of tacos? Why not place it on display front and center? Because the tacos definitely deserve it. That’s why I made this tacos cut file for all my taco loving peeps. There are so many places that I can think of to put this cut file. My plan is to iron it onto a shirt to express my taco love loud and proud. You can also place it onto your morning coffee mug. Tacos for breakfast, anyone? I say to each, his own. 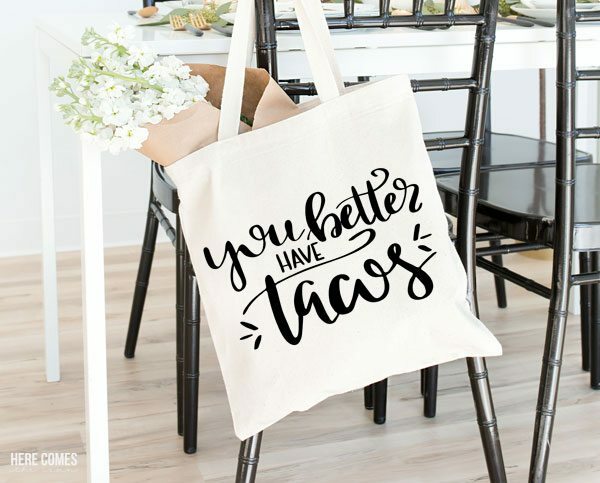 I just may even put it on the door leading from the garage into the house because when my husband comes home from the grocery store, if the ingredients to make tacos are not in the bag then he just needs to turn around and go straight back to the store to remedy the situation. This file is for personal use only. You may not sell it or redistribute it. First, download the cut file. This file is in SVG format and will work with Cricut machines and Silhouette (Designer Edition). It may also work with other personal cutting machines but I don’t have any experience with them. I’ve also included the file in JPEG and PNG format for use in programs such as Photoshop. If using the file as an iron on, make sure to mirror it first within Silhouette Studio and Cricut Design Space. Cut it out on heat transfer vinyl, weed it, and use an iron or Cricut Easy Press to iron on to fabric. If you are not using the file as an iron-on, you do not need to mirror it. Just cut it out as-is. You can cut it out on cardstock or vinyl. If you are interested in using other types of material, the Cricut Maker has the capability to cut several other materials such as fabric and leather. If using cardstock or vinyl, make sure to use transfer tape to place your file so that you can line everything up straight. And those are the basics. I hope you have fun with this tacos cut file! If you see me wearing it on a shirt, I expect tacos to be provided to me pronto! I like mild sauce.